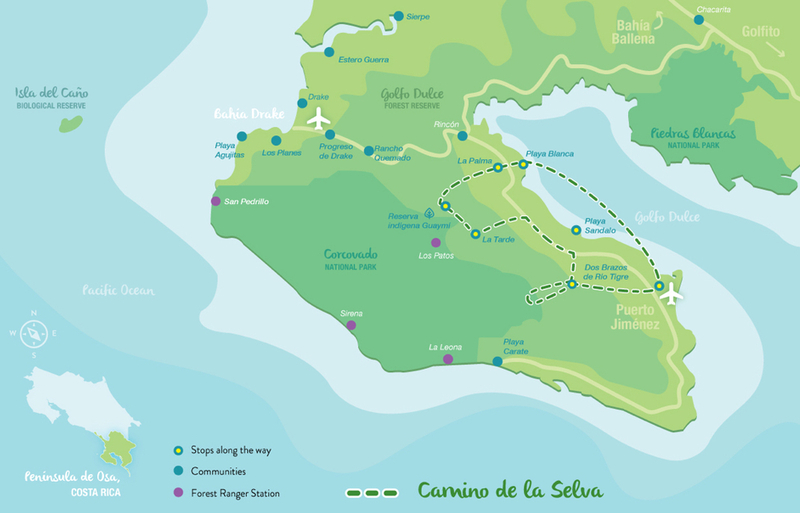 This is a great combination between pristine forest, culture and the iconic Golfo Dulce. More than a compass, a map, or a GPS, it is the rustle of the wind, the crashing roar of the waves, the advice of the Ceiba tree, the footprints in the mud, and the legacy of our ancestors... they show us which paths to follow and to share. Join us in this journey and discover the natural treasures hidden deep inside some of the least known areas of the Osa Peninsula. Difficulty: Good physical condition for medium difficulty hikes. Some horseback riding and kayak experience recommended. Day 3: Amazing hike to Los Patos Operational Center at Corcovado park and visit Los Patos Waterfall Walk riverdown through the park to the Alto Laguna indigenous Community Overnight stay at Golfo Dulce, Blanca beach. - 5 tours (Horseback riding, night walk, butterfly farm, birdwatching tour, hiking to Corcovado National Park). - Meals: 4 breakfast, 3 lunches and 3 dinners. - Services and transportation not mentioned. - Optional or additional activities services. - Porters to carry luggage during the horseback riding tour. - Bilingual tour guides for all other tours (can be arranged upon request for anadditional cost).